Garuda Indonesia’s decisions to slow its international expansion and raise domestic fares have led to a significant improvement in profitability in recent months following a dismal 1H2014. The airline group remained in the red in 3Q2014 but the loss was very small compared to 1H2014 and Garuda had a profitable month in Sep-2014. Garuda is planning to resume some international growth in 2015. But the growth will be relatively modest and Garuda has made sensible adjustments to its fleet plan, deferring some deliveries and opting against acquiring additional widebody aircraft. Garuda’s ability to recover from the challenges of 1H2014 puts the group in a relatively strong position as longstanding CEO Emirsyah Satar exits after 10 years at the helm. Mr Satar’s replacement will still face challenges but Garuda is now a vastly more capable force than a decade ago to compete in the increasingly difficult Southeast Asian marketplace. Garuda on 13-Nov-2014 reported financial figures for the nine months ending 30-Sep-2014, including an operating loss of USD250 million compared to an operating profit of USD29 million in 9M2013. The group incurred a pre-tax loss of USD299 million for 9M2014 compared to a loss of USD3 million in 9M2013. Revenues were up 4% to USD2.802 billion. The nine month figures are a clear indicator of the challenging market conditions that Garuda has confronted so far this year. But the losses were only slightly larger than the losses reported in late Jul-2014 for the six month period. For 1H2014 Garuda reported an operating loss of USD234 million and a pre-tax loss of USD266 million. Garuda did not provide a 3Q2014 breakdown in its results announcement to the Indonesia Stock Exchange but based on the 1H2014 figures the quarterly operating loss was only about USD17 million (compared to an operating profit of about USD15 million in 3Q2013). The pre-tax net loss was about USD32 million in 3Q2014 compared to a break-even figure for 3Q2013. Garuda reportedly was profitable in Sep-2014 (with a USD22 million profit according to Reuters) and was roughly break-even in Aug-2014. The airline had another big loss in Jul-2014 (USD42 million according to the Jakarta Post), driving the overall loss for 3Q2014. As CAPA previously stated, it was a very poor performance in the international market that drove Garuda’s large loss in 1H2014. Garuda also had to contend in 1H2014 with the depreciation of the Indonesian rupiah and slower economic growth, which impacted domestic demand and yields. Garuda’s international RPKs dropped by 3% in 1H2014, an alarming figure given that ASKs increased by 15% as the airline expanded its medium/long-haul operation with additional A330 and 777-300ER widebodies. Garuda’s international load factor was only 63% in 1H2014. After reporting its 2Q2014 results Garuda promised it would reduce international capacity by cutting unprofitable routes, deferring some aircraft deliveries and accelerating aircraft retirements. Plans to add Manila and Mumbai in 2H2014 were scrapped while services on the Jakarta-Taipei route were suspended. Garuda is now instead relying on SkyTeam partner China Airlines to serve the Taipei market and is focusing more on SkyTeam, which it formally joined in Mar-2014, to grow its international network. Garuda’s international capacity growth started slowing in Jul-2014 and ASKs have been flat since Aug-2014, bringing to a one-year period of high double digit growth. This has led to an immediate improvement in load factors. 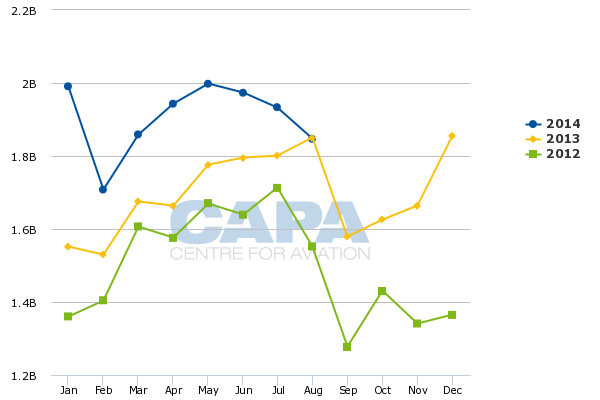 In Aug-2014 Garuda’s monthly international load factor was above 70% for the first time in a year. Not surprisingly Aug-2014 also marked the month Garuda turned the corner financially. The airline also has seen an improvement in its domestic business as a long overdue increase in fares improved yields and offset the earlier depreciation of the rupiah. Mr Satar in Oct-2014 told CAPA that Garuda had adjusted capacity to better reflect market conditions, which has resulted in a stronger focus on the domestic market. He said international ASKs had been reduced but will start to increase again in 2015, pointing out that the airline is still planning further growth in the Japan market while the China market will see some growth through new charter flights. For example Garuda is launching five weekly flights in late Mar-2015 from Jakarta to Nagoya, which will be its fourth destination in Japan after Osaka, Tokyo Narita and Tokyo Haneda. As CAPA previously outlined, Garuda has already expanded capacity in the Indonesia-Japan market by about 50% since mid-2013 as it launched two new routes and up-gauged some existing flights from A330s to 777-300ERs. Garuda’s widebody fleet currently consists of 20 A330s and six 777-300ERs with 15 additional A330s and four more 777-300ERs on order, according to the CAPA Fleet Database. The 777-300ER fleet was initially acquired for new long-haul flights to Europe while the A330s are used within Asia-Pacific. But most of the 777-300ER fleet is now used within Asia-Pacific and to Saudi Arabia, Garuda's only destination in the Middle East, as the carrier has scrapped plans to launch several new routes to Europe. Its only long-haul route is now a five times per week Jakarta-Amsterdam-London Gatwick service. Garuda also initially planned to place a new widebody order in 2014. As Garuda entered 2014 it was evaluating several new widebody types including A350s and 787s. But Mr Satar told CAPA that Garuda no longer plans to order more widebody aircraft, deciding the A330s and 777s that it has on order will be sufficient. This is a sensible move as Garuda’s biggest opportunities are in further growing its domestic and regional international operations. For this, a large widebody fleet is unnecessary and Garuda will more fruitfully use alliance partners to expand its network outside Asia-Pacific. The original plan to operate several non-stop flights to Europe (including France, Germany and Italy) and potentially resume services to the US now seems overambitious and risky. Garuda did proceed with its plan for ordering more narrowbody aircraft in 2014, announcing in Oct-2014 an order for 50 737 MAX 8s for delivery from Dec-2017 to May-2023. In an interview with CAPA TV after speaking at the CAPA Asia Aviation Summit on 14-Oct-2014, Mr Satar pointed out that the 737 MAX 8s are intended primarily as replacements. He added that Garuda has 737-800NGs coming off lease starting in 2017 and the carrier analysed whether it was better to extend leases on current generation aircraft or acquire new generation MAX 8s. Garuda concluded that even with the higher cost of ownership associated with new aircraft this is more than offset by the operating cost savings that come with flying more efficient aircraft. Garuda currently operates 75 737-800s, according to the CAPA Fleet Database. Garuda’s 3Q2014 results filing indicates that the carrier only has one 737-800 coming off lease per year from 2017 to 2020. But Garuda has five 737-800s coming off lease in 2021 and eight in 2022. As part of its order 737 MAX 8 order Garuda was able to cancel four of its remaining orders for 737-800NGs. In its 3Q2014 results announcement Garuda stated that the four 737-800 aircraft that have been cancelled were originally slated to be delivered in Aug-2015, Dec-2015, Jan-2016 and Feb-2016. These four aircraft were part of a 20-aircraft order placed in 2010. Garuda earlier deferred several A320 orders which it placed in 2011 on behalf of budget subsidiary Citilink. 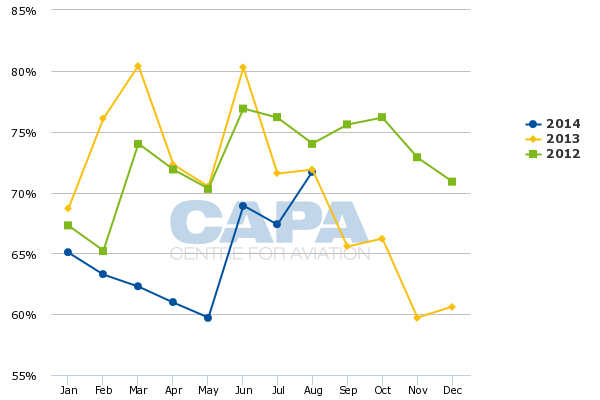 As CAPA previously analysed, Citilink only plans to add five A320s in 2015 compared to an original plan to take 12 A320s. The deferral of A320s and the more recent cancellation of four 737-800 orders are well-advised as it gives Garuda an opportunity to slow down its rate of expansion over the next 12 to 18 months. But Garuda and particularly Citilink will still grow relatively rapidly. In the CAPA TV interview, Mr Satar pointed out Garuda still needs to expand because the Indonesian market is still growing. “But probably in the next few years it is not going be at the same rate as the last few years,” he added. Mr Satar is now nearing the end of his second five-year term as CEO. As government rules preclude another extension, Mr Satar is preparing to step down by early 2015. Mr Satar has had a challenging final year as Garuda has been confronted with intensifying competition, overcapacity, slower economic growth in Indonesia and the sudden devaluation of the rupiah (about 50% of Garuda’s revenues are in rupiah but 75% of its costs are in US dollars). But Mr Satar has responded to the difficult conditions by making adjustments which once again position Garuda well for the future. Mr Satar has had a remarkable run, restructuring and turning around an airline that was on the brink of bankruptcy. The financial turnaround was capped by an initial public offering in 2011 – which Mr Satar calls his biggest accomplishment – while a drive to improve service standards and raise Garuda’s international profile was capped by the Mar-2014 ascension into SkyTeam. Mr Satar’s implementation of a successful dual brand strategy and ability to win back domestic market share were also cited in his selection recently as CAPA’s 2014 Asia-Pacific Airline Executive of the Year. Even with the recent improvement in its financials, Garuda will almost certainly end 2014 with its annual first loss since 2006. But the group has responded relatively well to extremely difficult market conditions, which have driven losses at about 80% of airlines in Southeast Asia. More challenges lie ahead and competition will not ease. But Garuda has a bright outlook as long as it focuses on leveraging its strong position in Southeast Asia’s largest market and avoids overzealous international expansion.